The most important thing to remember about Baptism is that it is God’s action. We cannot merit our own salvation; we cannot boast in anything save in the Cross of Christ (Galatians 6:14). One of the amazing things about God is that He loves us while we are sinners (Romans 5:8). He wants us to lead better lives and gives us His grace to do so. He loves us if we’re young or old. We see Jesus gathering children together, blessing them and saying the Kingdom of Heaven is their’s (Matthew 19:14). Baptism is the sign that we are united with Christ and God wants everyone to be united with Him in this way. That’s why the Church has always baptised children. S. Paul wrote that he baptised whole households (I Corinthians 1:16) and this would have included babies. 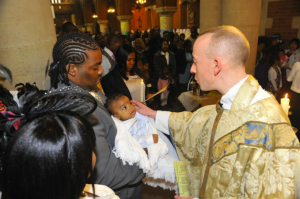 Some Christians have decided not to baptise babies. That’s sad, but the Church of England has always done it. Everyone of us wants to understand the faith better. Hopefully you can see how your faith has grown over weeks/months/years. (If you can’t, you need to speak to someone about that!). We don’t have to understand God before we are baptised. No one fully understands God in this life (Isaiah 40:13,17 and I Corinthians 13:12). 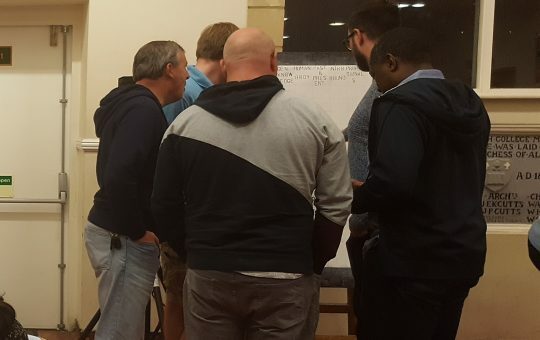 The questions that are asked of parents and godparents are:Will you pray for these children, draw them by your example into the community of faith and walk with them in the way of Christ? Will you care for these children and help them to take their place within the life and worship of Christ’s Church? Do you renounce the deceit and corrupt of evil? Do you submit to Christ? You become a full member of the Church throughout the world. You are washed clean of all your sins, including Original Sin. Original Sin is something we are all born with since Adam and Eve committed the first sin (Psalm 51:5). If you’ve been coming to this Church for a while, you could have your child baptised during the Sunday Mass. This cannot happen during the Sunday Masses in Advent and Lent. If you haven’t been coming to this Church, but still want your child to be baptised, it could happen at 12noon on Sundays at S Mary’s or at 3pm at Good Shepherd. Speak to one of the clergy to arrange a date. The priest doing your child’s Baptism will need to see you and the godparents before the Baptism to talk through it all. ** If you have family or friends who are going to arrive late, please tell them the service starts 30 minutes before it does. If you’re having a party after the Baptism, you may want to hire one of our halls. If so, please ring 020 8808 6644. 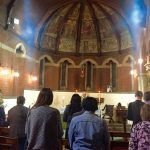 Can we have a Mass with the Baptism? Many people like to receive Holy Communion during a Baptism service. If you would, let the priest know when you first speak to him. During the service, we will wrap the child in a white blanket. If you have one that you would like to use, bring it along. If not, don’t worry – we have one you can use. Anything you like. Some people wear white at their Baptism, but it doesn’t matter. No, but it would be great if you gave a donation! If you pay UK Income Tax, please put it in a blue envelope with your name and postcode on it. Can we take photographs during the service? Yes! 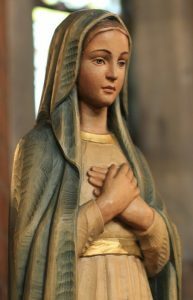 If you want it to be recorded, please tell the person to arrive in plenty of time beforehand so he/she can speak to the priest. If the Direct of Music is playing, you need to ask his permission too. Can we have music at the service? Yes, but you will need to speak to the Director of Music to arrange this. Does the baby need to cry? Some people have a tradition that if the child doesn’t cry at his/her Baptism, the devil hasn’t gone out of him/her. This isn’t the case: Christ is still victorious! Do they live near to the child? Normally there are three godparents and at least one should be the same gender as the child. 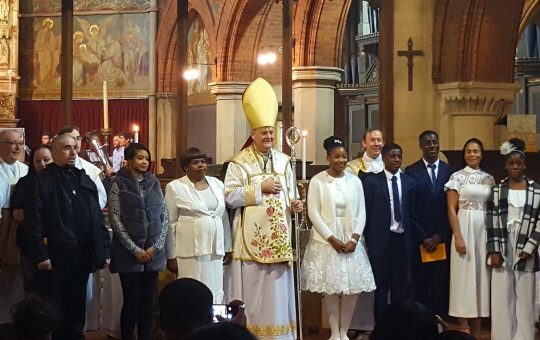 Godparents must be baptised and should preferably be confirmed. Many of the first Christians had two stages to becoming a Christian. We see this in Acts 8:14-16 where we are told, “Now when the apostles at Jerusalem heard that Samaria had received the word of God, they sent to them Peter and John, who came down and prayed for them that they might receive the Holy Spirit; for it had not yet fallen on any of them, but they had only been baptised in the name of the Lord Jesus.” Confirmation is seen then in the Gift of the Holy Spirit, that same Spirit who descended on the apostles at Pentecost. In this parish, people can be confirmed once in they’re in year 7 at school. There’s no upper age limit! There are seven weeks of classes before that and the Bishop has to come to confirm. Once someone has been confirmed they are able to receive Holy Communion.